OLDRIGHTIE: A Hasbeen Rises Up. What A Ridiculous, Self Absorbed Plonker. A gross, narcissistic, evil, yet to be indicted war criminal, rich beyond measure on the back of British taxpayers, probably closet bi-sexual predator, crawls out of the establishment's woodworm holes ravaging their rotten timbers. I briefly listened to his whining and affectacious twang with a sudden urge to vomit. That he was given air time was in itself pathetic but sadly predictable. I listened to President Trump lambast and justifiably excoriate the media earlier, in a brave and ebullient manner. So refreshingly different to the weasel toadying of people like Blair. Sucking up to the various empires of propaganda, such as produced by Murdoch's sycophants. I was suddenly being dragged back a decade to this clown's sudden parading before his paid up mates and Bilderbergers. He was ever the blind fool playing an out of tune pipes divorced totally from reality. His sheer stupidity in failing to realise he was a prime mover to guarantee the brexit decision in favour of leaving that ghastly EUSSR. Bliar's mass immigration gerrymandering but one of many crimes against British tradition and decency. Here, like all of the Labour failures over 13 years of vote rigged power, is a man who dares to suggest, in that weird, whiny voice, that the NHS, schools and the breakdown of society is nothing to do with his policies of PFI paupering building contracts making his corporate and banking pals rich out of the taxes paid by the poor. An individual prostituting himself at the feet of tyrants and despots to turn a few million quid for himself and his leech sucking family. Like Kinnock, Straw, Prescott et al masters in the art of nepotism and sycophancy. All of them with interests in furthering the rise of a Federal Europe and opportunities to grow ever fatter and more unpleasant, sat at the festive banquets of interpersonal backslapping and glad handing. All whilst the poorer and ever more exploited people of Greece and Southern Europe toil on poverty level wages to supply these ghastly people with their spoils. 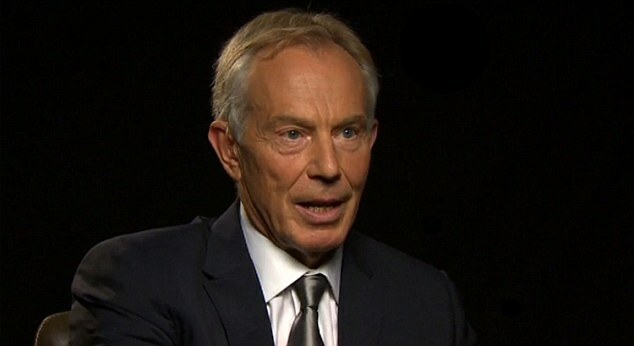 We should hold fast to the imagery of Bliar before the Hague. preferably alongside Hillary Clinton, in the dock. The charges read out of how their lust for power has brought about the deaths of millions of innocents, the rise of the butchers from ISIS and the hapless state of a world run by arms dealers and their agents in Governments across the planet. I suppose this circus hogging a few minutes of airtime and badly choreographed by a delusional next President of The United States of Europe is a blessed relief from the Russia and Vladimir bashing requirements of those very same arms dealers and corporate warmongers. People and banks desperate to justify the need for the gross and wasteful billions of dollars sloshing around the cesspits of nefarious and gross wealth creating nastiness drawn from the suffering of the little people. We can also be grateful that the fools still believing they are not losing their grip on power, for so long held tight with the collusion of a bought and paid for media cartel, have utterly failed to understand how President Trump came to be elected. That is coupled to why, in both cases, that and Brexit, despite significant voting fraud, they still lost on both counts. Bliar's conviction that nothing has changed since he last peddled his snake oil is a bonus for all sensible people. His lack of awareness as to his standing in most people's' minds is also to our advantage. I've yet to visit Twitter today but suspect his pathetic intervention will have gone down a storm. Storm drain that is! Indeed, I'd go as far as to suggest, as is likely, the motley fool's appearance today will be paraded across France, Holland and germany as some kind of shining light to lead the good people away from their awakening to democracy before dictatorship manifested by the likes of this yesterday man. A wreck as ugly, broken and pathetic as would a risen Titanic look dragged from the depths of the Atlantic. Or, in Bliar's case, from the depths of depravity, deep in a swamp populated by the most horrific of creatures, drawn into the muck and filth by the evil George Soros. If ever a present day mogul, manipulator and moron epitomised the establishment, it's Soros. Who just happened to lose a few billion out of Brexit and probably now out for revenge. Add his sidekick, Murdoch to his circle and we see how Bliar is a timely reminder of what we, the ordinary people, are up against. As much as this may turn out to be to our advantage, as France and Holland vote it does little to reduce the nausea producing sight of Bliar back on our screens. Thank goodness we, so far, can still choose to switch off the false, gurning idiot. I just published a lengthy diatribe on Blairs shenanigans over at my place, but to be honest your header really sums it up in a single sentence! In some ways its good that Lucifer is risen from the pit again and spouting his bile. If anyone could poison a movement just by being there or endorsing, its him. It's when you can't see the swine that you have to worry, wondering what this poisonous war mongering perma-tanned deviant could be up to otherwise. Impressed that you, or anyone normal, can stand the sight of let alone listening to the bile he spouts, i can't, and dare not let my fine wife see his foul mug on a screen, running short of screens.